This is Volume Two in the three part Reflections series. So much happened since Volume One! Originally the idea was for this to be book number two, but I got involved in the Oklahoma Centennial project that led to my book, "Oklahoma Proud", and then at the urging of some of my musician friends, I wrote and published "Songbook in My Head, Words in Search of a Melody!" Between the writing and the editing and the readings, time has slipped away. But here we are, and Volume Two of the Reflections series is in print and audio. If you have been reading my previous books, you're going to notice a handful of poems in this volume that are also in "Oklahoma Proud". This series is chronological, not topical. These poems are pretty much in the order that I wrote them, and are from the same time period. When I decided to write "Oklahoma Proud", one of the first things I did was to peruse what I had already written, (and had mentally assigned to upcoming books) and pull out the poems that seemed relevant. They were so well received that I set to work finishing the rest of this book! 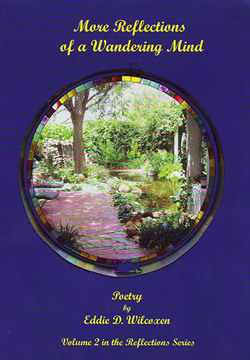 As you enjoy these poems, I hope it will feel like meeting an old friend in an unexpected place.